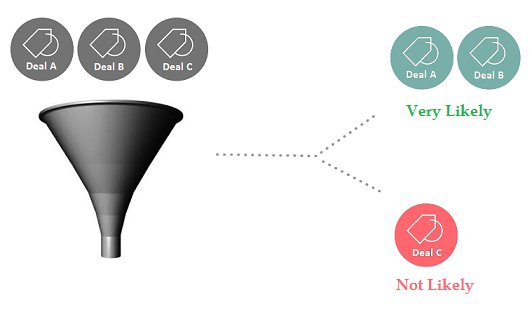 attention on deals that are at risk or performance bottlenecks via prescriptive insights. Kreato discovers the customer engagement patterns from historical data that impacts the sales closure. The system is trained continuously to learn & a prediction model is built from these patterns. Every deal is fed into this prediction model to predict the closure (winning) probability. 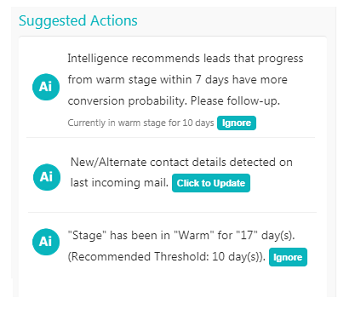 Kreato analyzes stage-to-stage progression of every won deal and learns on the timeline factors that impacts the sales closure. And then these timeline factors are further refined using algorithms and applied to predict the expected closure date for every open deal with no manual efforts. Kreato analyzes all the won deals over a period of time and derives the set of pipeline factors that usually keeps the deals on track and out of risk. And then these factors are further refined using algorithms and applied on current open deals to surface deals that are at risk along with the corrective prescriptions.